A new Sailability season offering opportunities to people with disabilities, starts at Grafham Water, near Huntingdon, on April 6. And will run through to the end of October. The main sessions are on Thursday afternoons, from around 1-4.30pm and the first taster session is free. After that membership is £30 a year. Grafham Water Sailability charity is run by disabled sailors and able-bodied helpers. And aims to coach all new members to sail to the best of their ability, whether with sailing buddies or solo sailing. There are also skippered trips in the club’s Drascombe Longboat. Anybody interested in sailing with us, or their carers, should make first contact by email then arrange a Thursday visit. Based off St. Andrew’s Road, Chesterton. It is one of only two Cambridgeshire with an Adaptive Rowing programme, the club has two stable single sculling boats to open up rowing to people with diverse physical impairments. The boats can be adjusted to accommodate rowers with various abilities. Almost all learners start their rowing experience in stable boats which have a safety line attached so that the coach can control their location on the river while they learn the basics. The club is happy to arrange a taster session at a time that suits you. Small groups also very welcome. 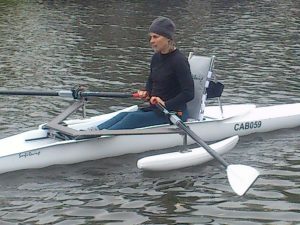 At future sessions, the boat set up can be tweaked to suit the rower and time spent on the water is gradually built up. £10 per year no matter start point, renewals are in December. £1.50 per session includes carer if needed. Friday 2pm – 3pm both pools. £2.85, one carer free. Meets Tuesdays after school, term time only at One Leisure St Neots pool. If your young people enjoy swimming, then Inclusive Sport Peterborough has just the thing. Anyone aged 14+ with a long term health condition, physical, sensory or learning disability can enjoy lane swimming, lessons, or aqua fitness classes on Fridays at Vivacity’s Jack Hunt Pool, between 5-9pm. Training and competitive swimming sessions are also on offer on Friday and Sunday nights at the regional pool with the Special Olympics Swimming Group & City of Peterborough Swimming Club. Charity Level Water funds1:1 swimming lessons for children aged between 4-11 with a physical disability or sensory impairment who do not have a social, learning or behavioural disability. It takes applications year round. More information on its website. Parents can make contact via that page. The swimming club is aimed at children of any age from birth to 19 with any disability. As far as possible, sessions are run by a qualified instructor with a number of volunteers. The club is working with Cambridge City Council Sports Development Team to expand the number of sessions available, aiming to provide opportunities for all abilities. The details of all the sessions follow (note that the suggested age ranges are not at all fixed, but for guidance). A parent, guardian or sibling can go in the pool to assist if necessary. These will be structured lessons with an instructor for those wanting to further develop their swimming skills in a deeper pool. It is recognised that the Windmill pools may be too shallow for older, larger children, so the Chesterton pool is also aimed at this group of children irrespective of their swimming ability. This session is for young children under 5yrs and those that need warmer water or a smaller, secure environment to swim. Siblings are welcome, but in the event of there being too many people (maximum 20 people), priority will be given to those with a therapeutic need. It is hoped that we will have the help of a swimming instructor once a month who can give advice on early swimming skills.